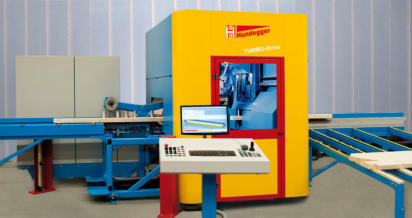 H undegger TURBO- Drive m achine The TURBO-Drive saw is a 1-blade fully automated component saw specially designed to cut roof truss components, I-joists and stair-stringers. Moreover, fully equipped with optional aggregates, the machine transforms in to a fully automated machine woodworking center. Drilling, labeling, marking and mill-work is than possible on this multi talent machine. Again, Hundegger is setting the pace for performance. Advantages • User friendly 3-D software, updates are free of charge • Modular system, machine can be adapted with more aggregates & tools at any given time • Timber cross sections from 20mm x 40mm to 160mm x 450mm can be processed regardless of finished part and rough lumber length • Fast and precise cutting thanks to the integrated part & job optimization • Multi language interface • Small footprint • Cuts stacks up to 4 parts high • Durable construction Did you know that our Canadian service location in Airdrie / Alberta exist since 2007 in order to support our constantly growing clients in Canada? Out-of Calgary, we offer a highly qualified pre-sale and after-sale service for the entire Hundegger production line and in order to do so, we keep a large stock of crucial spare parts and tools here in Airdrie. We also provide a telephone and email hot-line for our Canadian clients. Our well trained service technicians are Canadian Citizens / Permanent Residents of Canada and always on the go to assist when problems accrue - even and mostly on weekends. 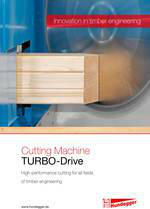 TURBO-Drive Brochure Please check the attached TURBO-Drive bro chure to find more information about the whole system. You are also very welcome to contact us for more detailed information on our products. Mobile Version of Hundegger Canada Inc.